We can’t wait to show you what Destin is like at Thanksgiving. Leave the colder weather and move south where the ocean meets the land, and the only thing separating the two are the sun baked white sandy beaches. You’ll see why we wouldn’t live anywhere else for Thanksgiving. There’s more to Thanksgiving than turkey and pumpkin pie. You can certainly get those here, but you may want to rise early on your visit for a walk on the beach at Henderson Beach State Park. Henderson Beach is home to our 30 foot high white sand dunes. Campsites are available so that you can enjoy everything the warm gulf breezes offer. Just down the way from Henderson Beach is Crystal Beach, home to the most adorable beach cottages painted in picturesque pastel colors. We will match our sugar-white sand beaches to those anywhere. If you prefer your activities inside, “Something Rotten”, a hilarious Broadway Play, is performing on Nov 20 at Mattie Kelly Arts Center Mainstage Theater located at 100 College Boulevard just east of us in Niceville, FL. Only one performance though, so get your tickets early.This will leave you laughing though the holiday. Charter Cruises to enjoy the views or Private Dolphin Cruises will have the entire family wanting more. Enjoy the spectacular sunsets and warm weather from the water with dolphin swimming, jumping and playing near your boat. If you prefer to captain your own ship, pontoon boat rentals are available. If deep sea fishing is on your bucket list, you’ve come to the right place. Captain Chris can find the Swordfish, Blue Marlin, Tuna and Shark. Fishing can be chartered for a few hours or an overnight excursion. Excursions include all tackle, bait, and even cleaning your catch! How about fresh Tuna for Thanksgiving dinner! There’s a reason we are called the Emerald Coast. Would you rather swim along with the fish instead of catch them? Destin offers some great Scuba Diving off the reefs for the advanced and classes for beginners that will get you ready for your certification. 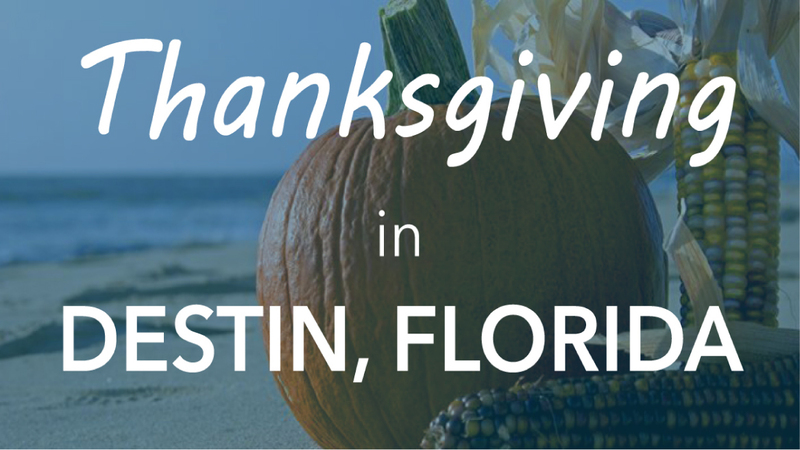 Back on land, you can enjoy Thanksgiving Brunch at Santa Rosa Beach or dinner at the Marina. Shop Saturday at Farmers Market or get a jumpstart on your Holiday shopping at Destin Commons. If your sport is antique shopping, be sure to visit the local shops to help decorate your Sugarloaf Apartment Florida style. Destin and the surrounding area hosts some great museums for just about any hobby you might enjoy like The Destin History and Fishing Museum (yes, we love our fishing). It displays some fabulous catches from off our shores, some historic fish boats and antique fishing equipment. Indian Temple Mound Museum shows off some artifacts from 1000 years of Native American culture in the area. Air Force Armament Museum is free to the public and has an outdoor air park containing 25 aircraft for you to enjoy. In the buildings, enjoy 100 years of Air Power compliments of the United State Air Force. Make this Thanksgiving about more than turkey and pie. Whether this is your first Thanksgiving in Destin or your 20th, we are sure that this year will be a memorable one.